and BL, and is dispensed from a 50 mL cartridge. 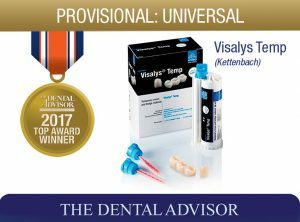 Visalys Temp has a working time of 40 seconds, can be removed from the mouth between 1:20-2:20 minutes, and has a final set time of 4 minutes from beginning of mix. Each cartridge comes with 15 mixing tips. 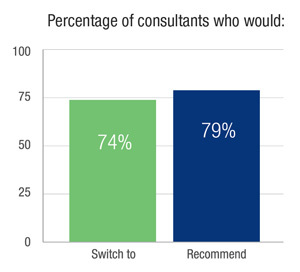 Visalys Temp was evaluated by 19 consultants in 579 uses. 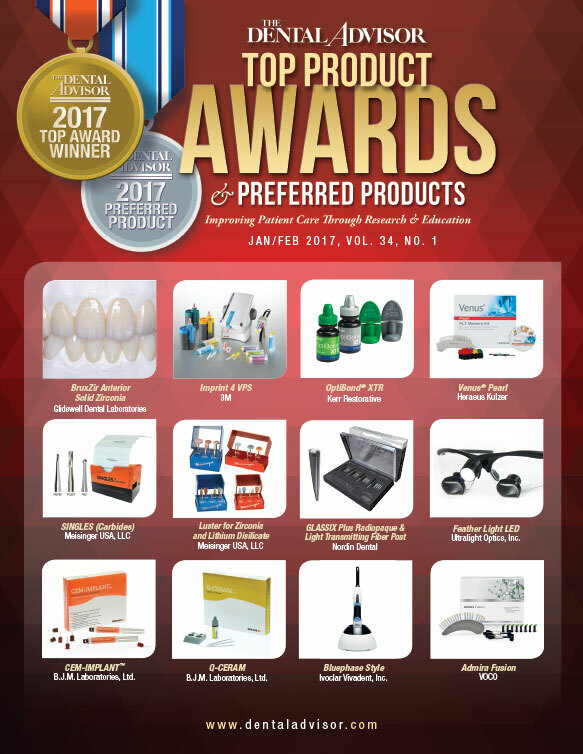 This provisional material received a 97% clinical rating. Excess material on adjacent teeth peeled off cleanly without much sticky residue. The surface of the formed provisional restoration had only a thin air-inhibited layer, which could be removed with alcohol. Visalys Temp set very hard, allowing margins to be trimmed and polished without chipping. Flowable composite could be used on areas needing repair. 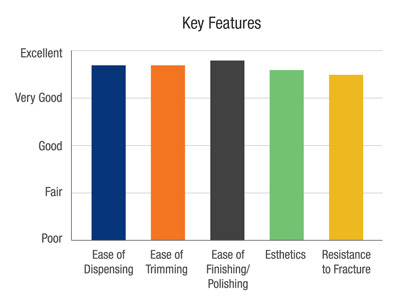 Consultants used numerous products and techniques for polishing, and the consensus was that the material achieved a smooth, glossy surface. The shades available satisfied the range of clinical needs. Shades are accurate and create very esthetic provisional restorations. 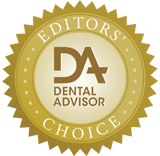 When removed within the recommended time, Visalys Temp can be removed over undercuts without locking onto the teeth. After setting, no noticeable shrinkage occurs, resulting in excellent fi t of provisional restorations. Visalys Temp sets hard and strong and provisional crowns have very good resistance to fracture and chipping. The material exhibits some brittleness in longer span bridges. 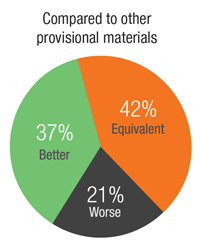 Thirty-seven percent of consultants rated Visalys Temp better than other provisional materials they were using and 42% rated it equivalent. Seventy-four percent would switch to Visalys Temp and 79% would recommend it. Works quickly on multiple-unit cases. Use alcohol to clean the inside and outside of the temporary restoration.